There are at least 3 other 7th chords that are variations of the two base ones. These are the dominant 7th, which is a major 7th with a flatted 7; the harmonic minor 7th – which is a minor 7th with a natural 7 instead of a flatted one; and the half-diminished 7th – which has an intimidating name and is basically a major 7th with everything flatted, or a minor 7th with the 5th flatted (both ways of looking at it have the same notes). A quick note about the minor 7ths – the regular minor 7th is sometimes called the natural minor 7th. This is to distinguish it from that new one, the harmonic minor 7th. The 6th video for Lesson 5 of Coursera’s online Developing Your Musicianship class is a review of what was covered previously in the week and last week, so its a little different from previous reviews. It recaps the 735 chord voicing, major and dominant 7th chords, blues song form and talks about chord charts. It doesn’t speak about AABA song form or review 4/4 and 3/4 time signatures, although the signatures are mentioned. That’s actually a lot of material, but aside from the chord voicing, I don’t think anything was particularly complex. So, Professor Russell begins this class with the statement, “So, of course you have homework, and its going to be a lot of fun, this homework. Well, its always fun because its, its mandatory that you have fun in this class.” That probably doesn’t bode well for me, since I’ve been complaining about a feeling of incompleteness and spelling errors throughout the lessons. He then goes over what he expects us to work on this week. First, he wants us to practice the C major 7th chord, and the 735 voicing for it. He demonstrates how to play it in root position, and then with the new voicing, and then reminds us that both are thought of as C major 7. He tells us to do the same with F major as well. We have to practice root position, and then 735, which is moving the root (the 1) to the bass, or left hand, and switching the 3-5-7 chord tones to 7-3-5. He says to just practice both chords, maybe giving them each 4 beats, or even playing it in 3/4 time and giving each chord 3 beats. He plays an example of each on the piano. He also says that we can break up the chord a little and arpeggiate it. As other bass players or students will know, this means to not play the chord notes all at the same time, but to play them individually instead (which is what I’ve been doing when practicing on the bass anyway). Additionally, he suggests that we play the C chords for two measures, and then switch to the F chords. He plays an example of this as well, counting so we can see how 3/4 sounds, as well as arpeggiating the chords. Ok. I took a little break today and started a Facebook page for the blog – and, boy, is it ugly. Its probably about time, since the blog is old enough to start preschool now. But, back to business. Video #2 for Lesson 5 of Coursera’s online Developing Your Musicianship class is an interesting combination. Its a review of last week’s material, just like always, but this time, it includes new material right in the review, instead of pushing that off for the next vid. Professor Russell begins with a review of the major 7th chord. He tells us to remember that its basically a triad with a 7th on top. Then, a mere 30 seconds into the review, he changes gears and says, “Now, what we can do is, we can do a different voicing, and that is taking your notes and using the same notes, but putting them under a different formation.” He demonstrates by taking the root of a C major 7th chord and moving it from his right hand, from which he was previously playing all of the notes, and moving it to his left hand, an octave down on the piano. Then he says that instead of playing the E next, he’ll play the B, then the E and then the G.
So, for those of you who are new to this, like I am, this is what he did: He took a C major 7th chord, which is C-E-G-B (1-3-5-7) and then moved the C, or 1, way to the left, to his other hand. He then switched the order of the other notes from E-G-B (3-5-7) to B-E-G, or 7-3-5. What we have then is the C being played essentially in the bass register, and the rest of the chord being played by his right hand, but in a different order. 735 voicing: Cmaj7 voiced as C (in a lower octave) and B-E-G, instead of EGB. The 6th video for Lesson 4 of Coursera’s online Developing Your Musicianship class reviews 7th chords, a blues progression and then goes over this week’s homework assignment. Professor Russell begins the video by asking what we covered today. 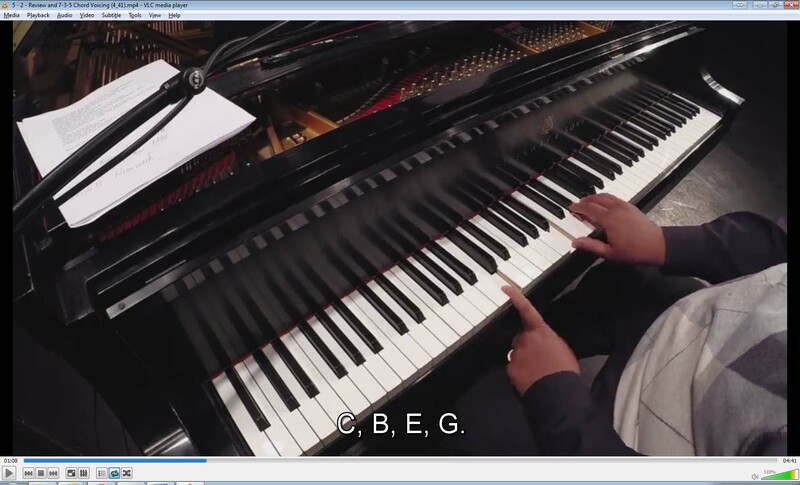 He answers it by saying that we covered C major 7 (C, E, G, B) and playing it on the piano while the onscreen music staff illustrates what’s being played. He then does the same for F major 7 (F, A, C, E) and reminds us that the major 7th chords are just major triads with a 7 on top. He continues by reminding us that we also learned what a G dominant 7th chord is (G, B, D, Fb). While doing this, he asks what a dominant 7th chord is and answers by showing us that its a major triad with a flatted 7th on top. He shows this in C as well, as [C, E, G, Bb]. He tells us that we should practice playing major 7th chords and then dominant 7th chords, alternating between C and F chords and giving each 4 beats. So, play CMaj7 for 4 beats, FMaj7 for 4 beats and then repeat a few times. Then, do the same for the dominants – C7 for 4 beats, F7 for 4 beats and repeat until we have it down. Then, he gets into something more interesting. 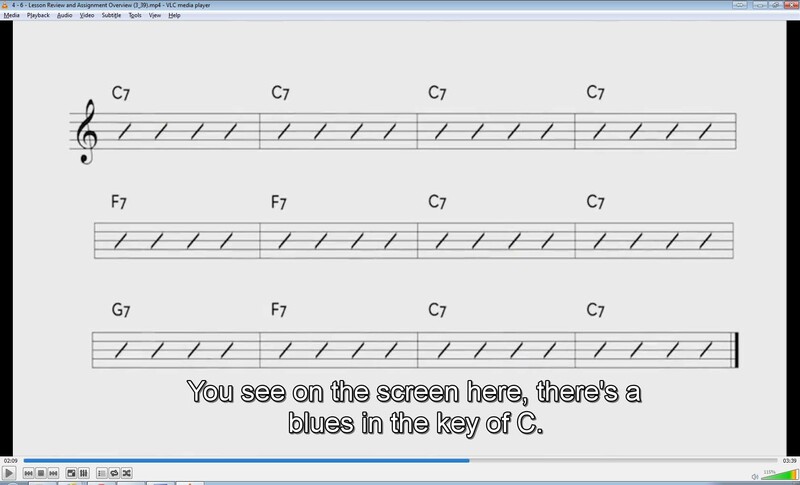 He says, “Now, another way to practice a dominant 7th chord is actually play a blues.” He shows us a blues in the key of C, onscreen and tells us that its made up of all dominant chords. He plays the blues progression and explains that we have C7 for 4 bars, then F7 for 2 bars, back to C7 for 2 bars, then G7, F7, C7. He then continues explaining that this progression uses the 1 chord, 4 chord and 5 chord. Finally, he says that he’s like for us to identify a pre-existing blues. We can look online or check our own music collections. He doesn’t say that we need to submit it or anything, so it looks like we just need to be able to identify one outside of class. The 5th video for Lesson 4 of Coursera’s online Developing Your Musicianship class is ear training for 7th chords. Its really brief and right to the point, so this write-up will follow suit. Professor Russell begins the practice video by recapping that we know what major 7th chords are and what dominant 7th chords are. He then explains that he’s going to play a series of 7th chords. They’re either going to be major 7ths or dominant 7ths. We’re going to listen to them and see if we can figure out what kind of chord is being played. He reminds us that the major chord has a “nice, very happy kind of sound,” and the dominant 7th has “a little edge to it, little tension.” The tension is created by two notes – the 3rd and the 7th (remember that the 7th is flatted). He then plays seven 7th chords, playing each twice and giving some time for each one to settle into our ears. The video doesn’t answer what any of the chords are, but the online version has a quiz built into it, which lets students select between major or dominant answers for each chord played.